Spectro-polarimetric light-scattering, or merging spectral and polarimetric light-scattering information, is a growing interest in a wide range of scientific fields. Recently, it has been demonstrated how spectral polarimetric light-scattering could be employed to probe microphysical properties of particulate media, for instance mean particle size or relative complex refractive index. Fundamental advantages of merging spectral and polarimetric information for light-scattering are to address distinct scattering regimes, probe systems of particles at different scales, and extract useful information about a particulate media of interest. The challenge of simultaneous retrieval of microphysical properties of particulate media, without a priori knowledge or use of simplistic assumptions, is addressed throughout this review. 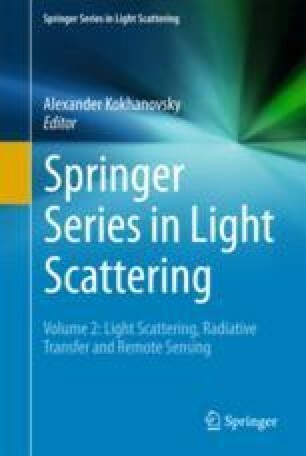 The authors would like to thank Matthew Berg for helpful comments regarding radiative transfer equation and for many debates in the field of light-scattering. We are also grateful to Michael I. Mishchenko, Gordon Videen, Ludmilla Kolokolova, and Alex J. Yuffa for fruitful discussions regarding spectral polarimetric light-scattering.